First, these Buffalo Bites are the perfect appetizer. With just three ingredients, they are super easy to make! 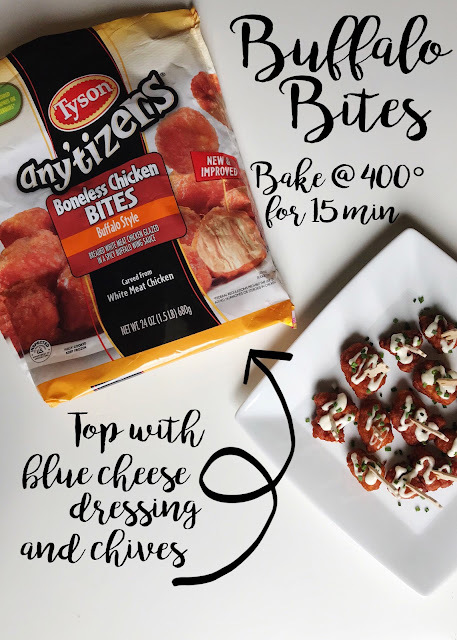 Simply take TysonⓇ Any'tizersⓇ Boneless Chicken Buffalo Style Bites, bake, and top with creamy blue cheese dressing and chives. Voilà! I cut some of the bigger ones in half and added tiny bamboo forks. You could easily mix and match your choice of any'tizer with your preferred dressing - the options are endless! 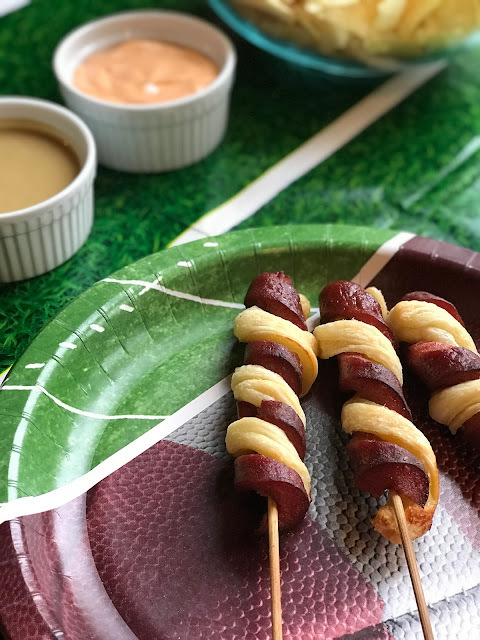 Next, these Twisty Hot Dog Dippers are so much fun to eat! I paired them with two easy dipping sauces. For each one, simply blend the ingredients and serve. 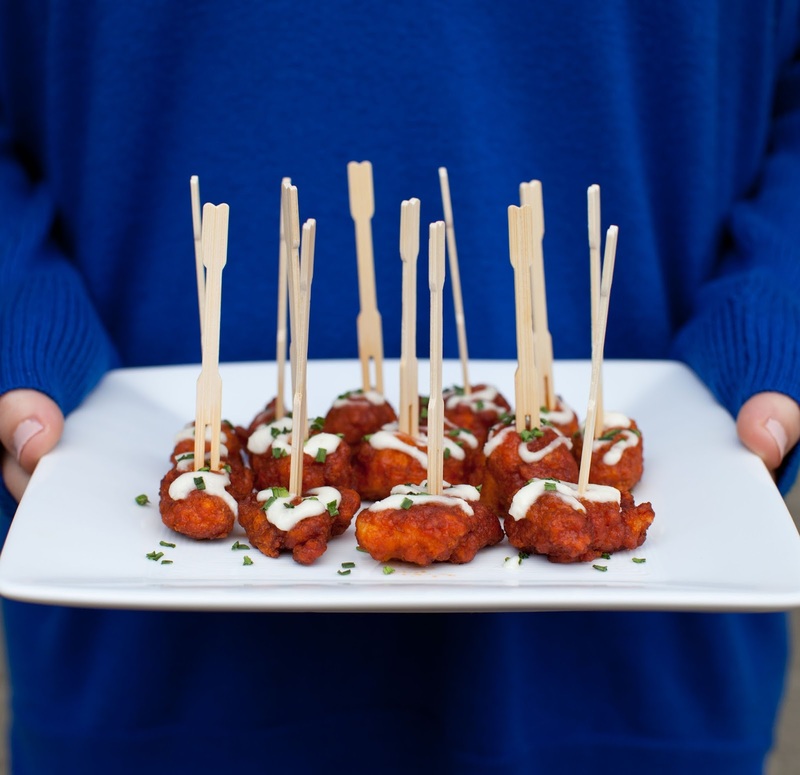 For the actual dipper, you'll need to start with some skewers (I soaked mine beforehand to make sure they'd survive the oven). Skewer each Ball ParkⓇ frank (I used halves), then run your knife at an angle along the frank as you roll the hot dog skewer away from you. You should end up with a spiral. Stuff the spiral with thawed puff pastry cut into thin strips (I doubled my strips to get a sizable amount in there). Bake at 400°F for 15 minutes (exactly the same as the any'tizers - you could even put them in the oven together!). I think the Twisty Hot Dog Dippers would also pair well with a cheese sauce, or even ketchup! If you're a planner like me, Walmart Grocery Pick-Up makes prepping for game day a cinch. I just put in my order online ahead of time, then select a pick-up window for when I know I'll already be out (this last trip, I scheduled my pick-up window for immediately after pre-school drop-off). Best of all, I can keep adding to my online order before placing it (and I don't have to worry about accidentally forgetting something from my list when I'm at the store). The day of pick-up couldn't be easier - simply drive up to a Walmart Pick-Up spot, call the phone number posted, and a friendly employee will come out and load your car for you. I've heard that when making the bags, the employees get to choose from the stock area, meaning they are working with produce and items that have just come in. I haven't verified this, but I will tell you all the produce I've gotten had been super fresh, and all the expiration dates on the perishable items are very far out, so I believe it. I usually loathe giving up control, but in this case it's wonderful so have the task just done for me! 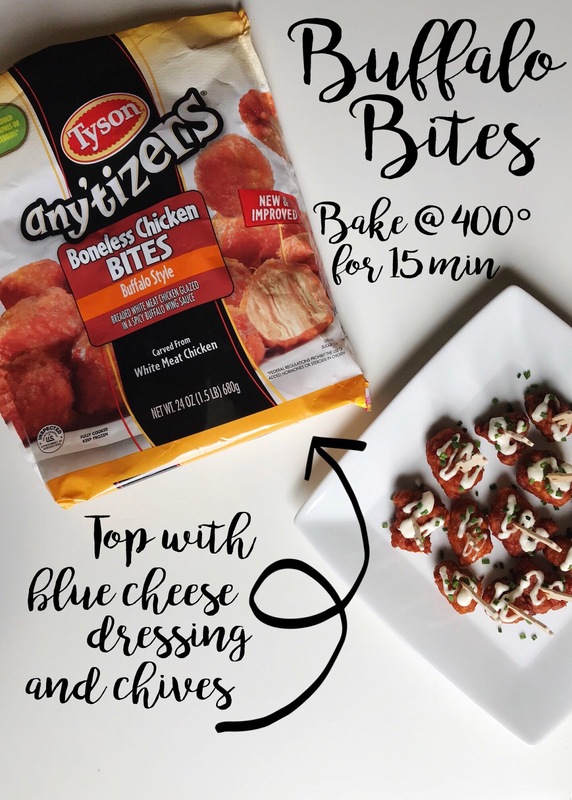 Click here to make TysonⓇ products and Walmart Online Grocery Pick-Up part of your game day winning lineup! 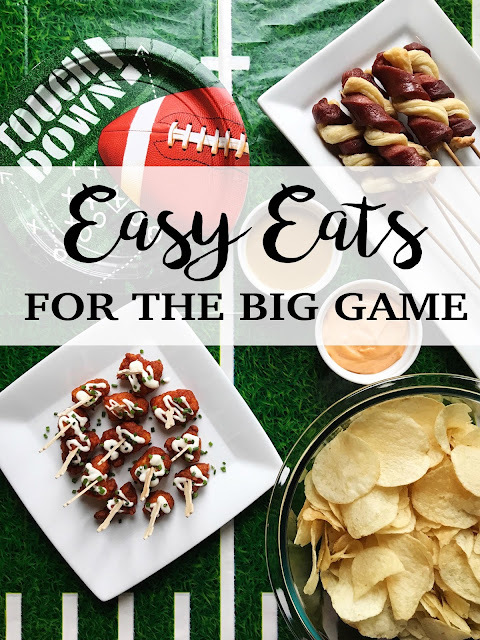 We are going to be coming home late from a weekend trip so I think our game day food is going to be as basic as it gets this year but I love your recipe ideas. Thanks!! Anything on a stick gets the thumbs-up from my boys, lol!